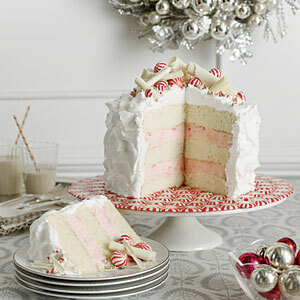 So we don't know about you, but we love everything peppermint. Beyond love. When I got my tonsils taken out in college, I specifically remember me wanting to schedule the surgery around the holidays because I knew I would be eating a ton of ice cream. Why would that matter? Well folks, the only time stores keep peppermint ice cream in stock would be during the holiday season. Some may call it mental. I call that planning ahead. Truly. So, we cannot think of a better recipe to share with you all than an entire cheesecake made with peppermints, We cannot imagine a more worthy marriage of culinary delights than cheesecake and peppermints. This will not disappoint. Nom. Nom. Are you kidding me? Am I supposed to click off pretending I didn't see this? IMPOSSIBLE!!!! This sounds AMAZING!!!!!! OMG I am so printing this and may just have to get ambitious enough to try it:) WOW, my egg sandwich is looking pretty sad right now. I love to bake and have been craving something peppermint lately. This is perfect! Holy macaroni...this loos SO GOOD! I love anything minty and mixed with pink cheesecake- wow...so so delish! You left out the 1/4 tsp. peppermint extract. It does make a difference!